Furtherfield.org: "Really Fake or Faking Reality? A Conversation between Patrick Lichty and Claudia Hart"
Alan Warburton: "Spectacle, Speculation, Spam"
Real-fake.org.2.0 is an updated and expanded version of the real-fake.org, an exhibition organized by Rachel Clarke and Claudia Hart. 2.0 includes the work of 51 post-digital media artists curated by Rachel Clarke and Claudia Hart now joined by Patrick Reynolds. 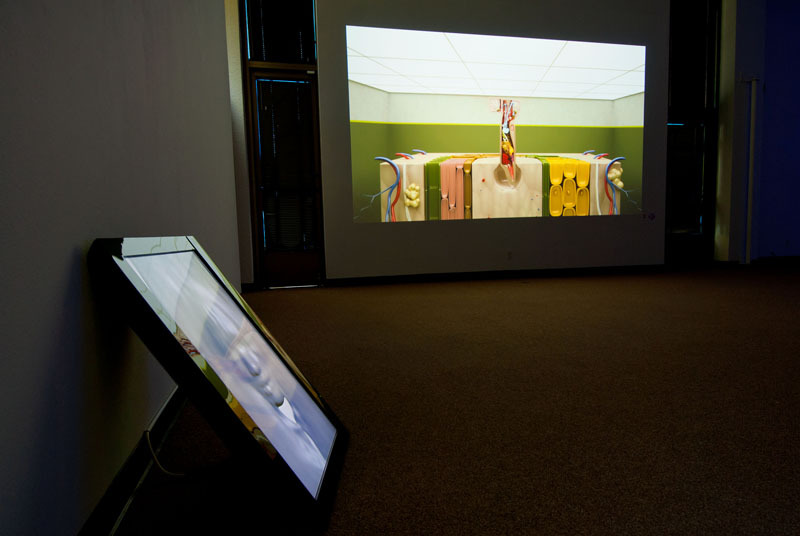 The original exhibition that took place in 2011, with a premiere at the Cal State Sacramento University Gallery, was accompanied by a website that defined a new and unusual medium at that time, even for the digital arts. 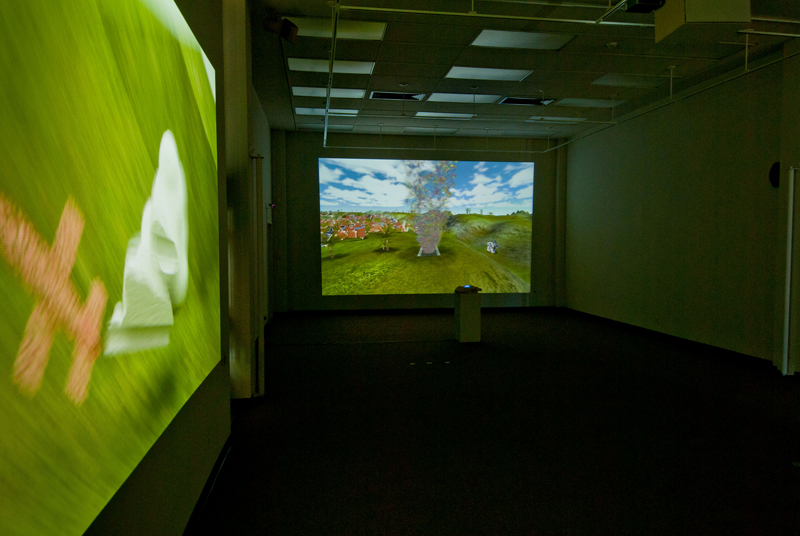 The exhibition toured the southern US and East Coast and showed the work of 20 artists that used an array of simulation technologies in the context of contemporary art, exploring for instance artificial “xyz” space, the non-referenced, non-indexical synthetic image/object, or the specific qualities of the virtual camera that records it. The exhibition showcased regional, national and international artists working specifically with digital softwares that simulate natural processes - from physics and biology to analog cinema and photography. Like the 2011 artists, those in the 2016 exhibition produce still images, animation, interactivity, sculpture and installation, using 3D animation as their primary medium. 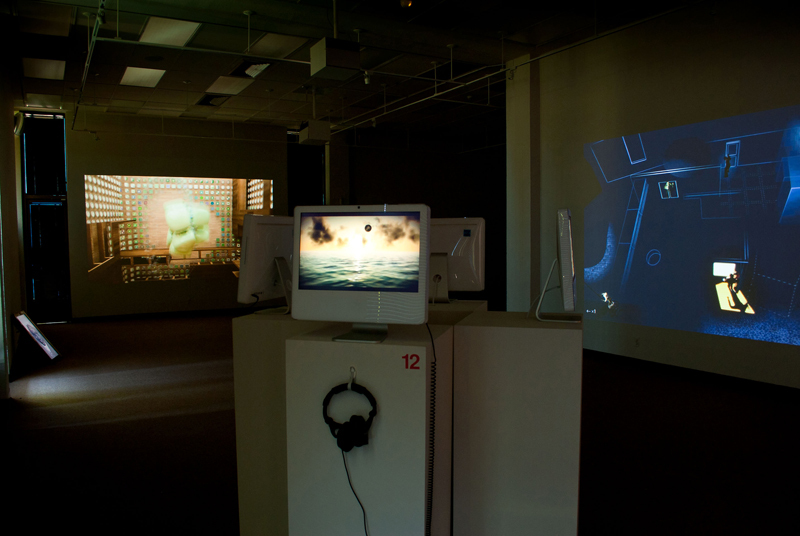 As with their predecessors - the video artists who adapted TV technologies for artistic uses - these artists have appropriated the technology employed in the production of 3D shooter games and feature-length Hollywood animation blockbusters, rejecting or adapting entertainment industry esthetics and content, and instead applying the medium to the trajectory of art history. Since the first exhibition, artists who work with simulations have driven a wedge into contemporary media practice. The 2016 update, real-fake.org.2.0, features the works of 51 contemporary media artists - a list that is by no means inclusive. 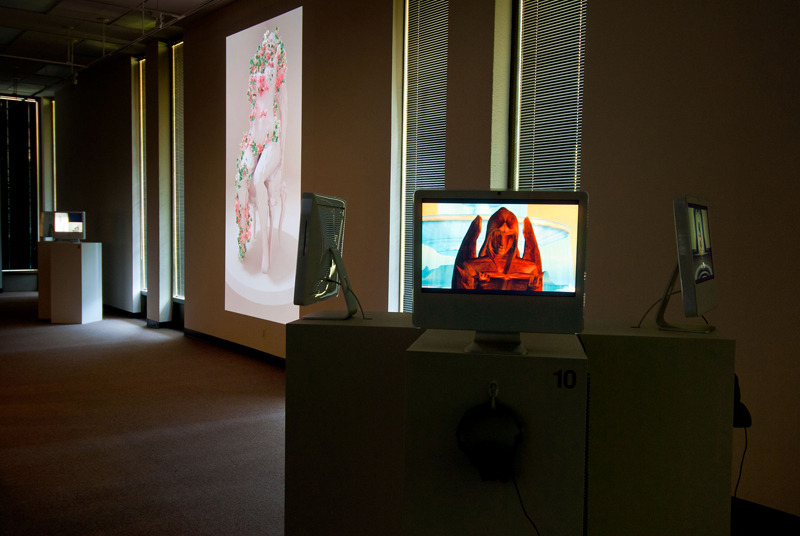 These artists consciously isolate and define a formal language native to the simulations of the real, a sub-terrain within an expanding contemporary digital culture, and integrate those elements into a variety of contemporary artistic strategies that emerge from the discourses of media and representation, as they have impacted on photography, experimental film, and installation-based works. 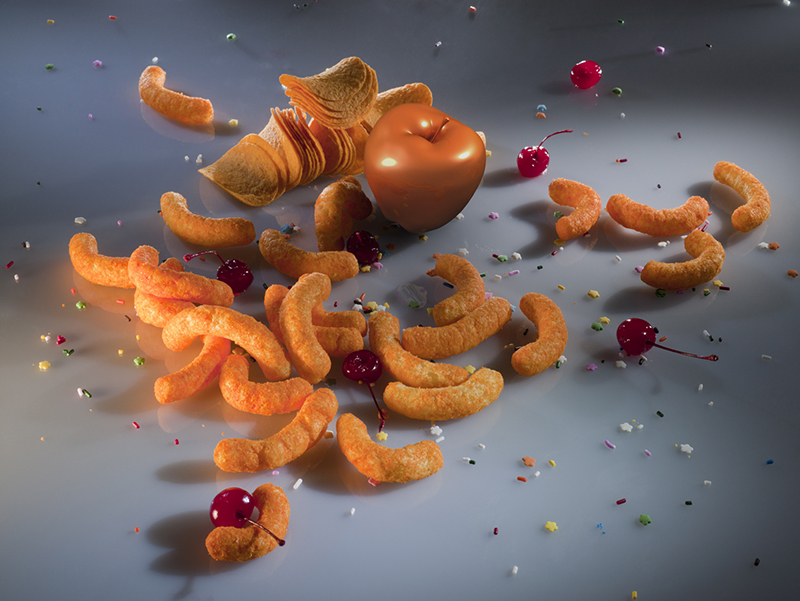 In 2011 it was rare to find artists involved in contemporary practice that were deeply invested in exploring the computer graphics of simulations. Since then, the practice has expanded and grown into a more broad, contemporary art culture. The languages of these 51 artists emerge from areas like figurative painting or abstraction, and from artistic movements ranging from Surrealism, Constructivism and Pop Art, as well as avant-garde cinema and experimental animation. Since 2011, “real-fake” computer graphics have finally erased the possibility of considering photography and film as a mirror of reality, as special effects have become pervasive in advertising and Hollywood film. The future of journalism as objective reportage has been threatened by “reality” television and Fox television, at the forefront in the branding of pseudo-news-as-entertainment. We also currently live in a culture of bioengineering where a prosthetic view of the human body converges the potential of cosmetic surgery with the technological reality of a science-fiction world in which the artificial has uneasily crossed a boundary into the real. The boundaries we once perceived between the physical and the virtual are breaking down as our exposure to simulation technologies becomes more ubiquitous. In the face of this paradigm shift, artists respond with an esthetic of the fake. This is art that crosses the Freudian uncanny divide, at first creating a sense of disorientation and questioning. Can we trust anything anymore? We have entered a space of madness, a psychotic space articulated by a culture that no longer embraces the difference between a representation and reality. The subjective reality and the objective merge. Fantasy rules. The real-fake.org.2.0 is an archive as an exhibition. The works of 51 artists have been collected on a series of reels. The real-fake.org website has also been expanded and updated. In addition to the original essays defining real-fake practice written by Claudia Hart and Rachel Clarke, are new essays by Rachel Clarke, Patrick Lichty and Patrick Reynolds expanding the language used to talk about simulations art with technologies that have exploded since the original exhibition, including printed sculpture and augmented and virtual realities. AES + F, Morehshin Allahyari, LaTurbo Avedon, Sophie Kahn with Lisa Parra, Gregory Bennett, Tim Berresheim, Sean Capone, Jose Carlos Casado, Rachel Clarke, Shamus Clisset, Birch Cooper, Gero Doll, Mark Dorf, Carolyn Frischling, Joe Hamilton, Claudia Hart, Kurt Hentschlager, Kim Joon, Mark Klink, Alex Lee, Patrick Lichty, Locurto-Outcault, Kristin Lucas, Sara Ludy, Gerhard Mantz, Chris Manzione, Claudia Mate, Alex McLeod, Shane Mecklenburger, Rosa Menkman, Jonathan Monaghan, Brenna Murphy, Eva Papamargariti, Will Pappenheimer, Sabrina Ratte, Michael Rees, Pat Reynolds, Benjamin Rosenthal, Nicole Ruggiero, William Robertson + Alfredo Salazar-Caro, Martin Sampedro, Ellen Sandor, Rick Silva, Keith Tolch, Katie Torn, Matthew Weinstein, Ryan Whittier-Hale, Frank Yefeng Wang, Snow Yunxue Fu, Giselle Zatonyl, and Zeitguised. Real-fake.org.2.0; exhibition installation, BronxArtSpace, November 19 - December 16, 2016. Works, left to right, by: Mark Klink, Sean Capone, Sara Ludy; photo by Gregory Bennett. Real-fake.org.2.0; exhibition installation, BronxArtSpace, November 19 - December 16, 2016. Work by Gerhard Mantz; photo by Gregory Bennett. Real-fake.org.2.0; exhibition installation, BronxArtSpace, November 19 - December 16, 2016. Works, left to right, by: Rosa Menkman, Shamus Clisset, Gregory Bennett; photo by Gregory Bennett. Real-fake.org.2.0; exhibition installation, BronxArtSpace, November 19 - December 16, 2016. Works, left to right, by: Will Pappenheimer, Gregory Bennett, Kristin Lucas; photo by Gregory Bennett. The Real and the Fake; exhibition installation, University Library Gallery, CSUS, April 1 - May 28, 2011. Works, left to right, by: Zeitguised, Alex Lee, Open Ended Group; photo by Sam Parsons. The Real and the Fake; exhibition installation, University Library Gallery, CSUS, April 1 - May 28, 2011. Works, left to right, by: Zeitguised, Sheldon Brown; photo by Sam Parsons.